As I've seen on the Flite Test Show crashing happens to everybody. But not a lot People seems to talk About it. And yes, it feels like someone hit you in the gut. But you can also gain something out of this experience. In my oppinion sharing is caring! 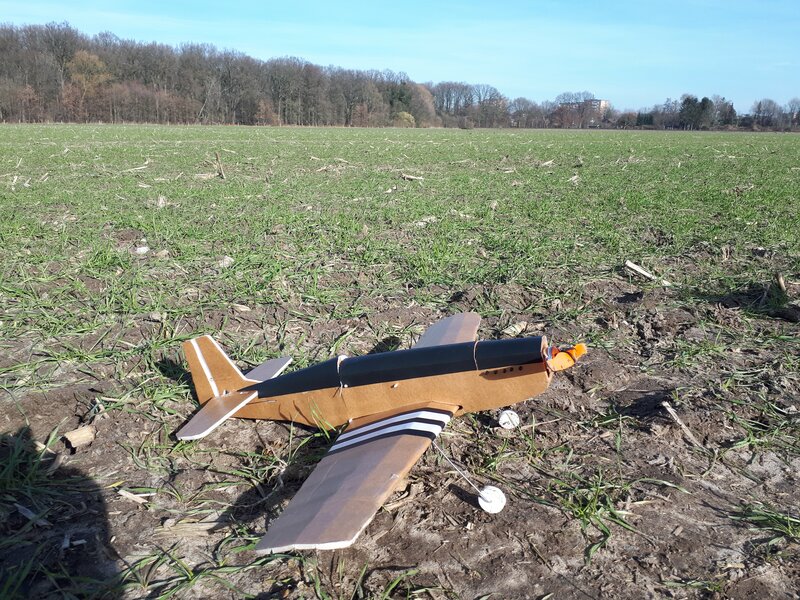 It was a wonderfull morning with almost no wind, a perfect day for a first flight. The maiden went realy well, but then the wind became stronger and a little bit gusty. And as a light breeze hit the plane it turned upside down and drilled it's nose into the ground. Back home I thought about the benefits of a detachable wing. 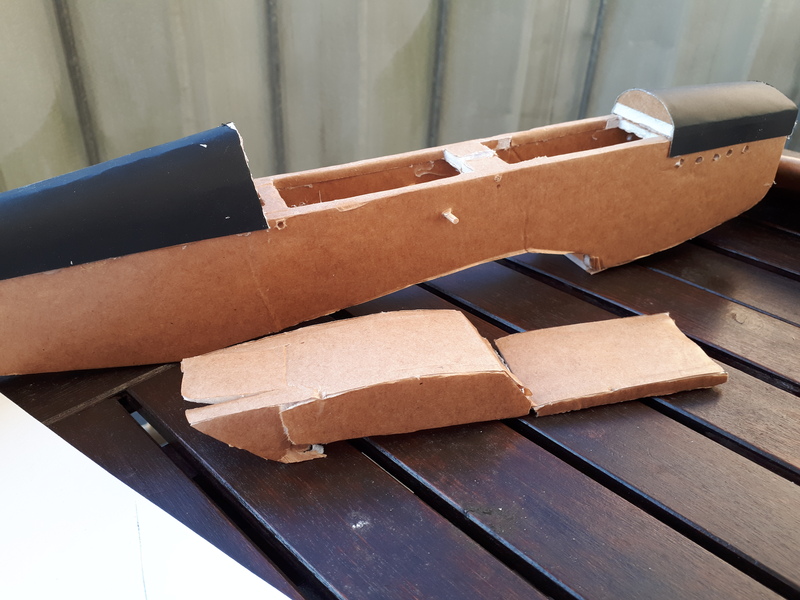 So I've started to repair the cuts at the wing and cut out some parts of the fusilage. ALso I've removed the landing gear. 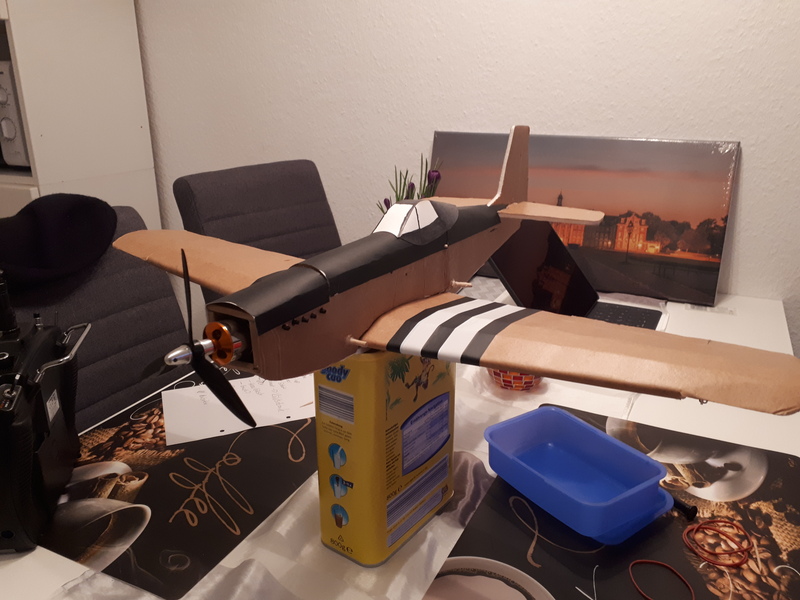 After a little bit of gluing the Mustang was back in service, looking better than before. Love the thread idea, great job. Will have to find a juicy story to share later today . Still, it makes sense to carry a large, yard bag in your flight kit for those times when nothing seems to be going your way. Most of the time I crash I do learn something new, that is the positive attitude I try to keep in mind. And there is a lot to be said about modifying designs after a crash. 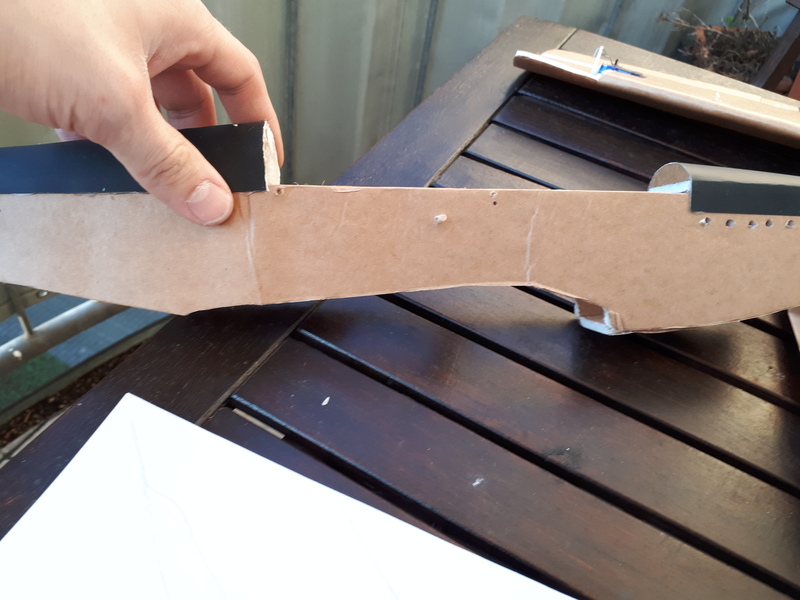 Every crash I have with my scratch builds has taught me how to make my designs better and stronger. One last point. There is nothing wrong with flying in the wind. In fact, it will make you a better pilot as practice makes perfect. That said, never use your show bird to practice, …anything. Always have a beater on hand to fly on those bad weather days, or to do that new trick you want to try. Hey Folks! Thank you for your comments! crashing is never an enjoyable experience. I am not trying to make crashing an enjoyable experience. I just want to show some people that it is possible to get something good out of somthing bad. One last point. There is nothing wrong with flying in the wind. In fact, it will make you a better pilot as practice makes perfect. That said, never use your show bird to practice, …anything. Also I think it could be great, when FT Veterans (ike you) can give some examples to Newbies (like me) that a sudden end of flying can be the beginning of a journey to something new. Let me use this as the being of my story. I a bit tried which is why I wanted to post a story tomorrow but since you brought it up I feel the need to post today, so please excuse me for any typos. When I just began flying my very first RC experience sucked. I stumbled upon FT after deciding that balsa gliders weren’t what I want to stay doing since they never came back to me. 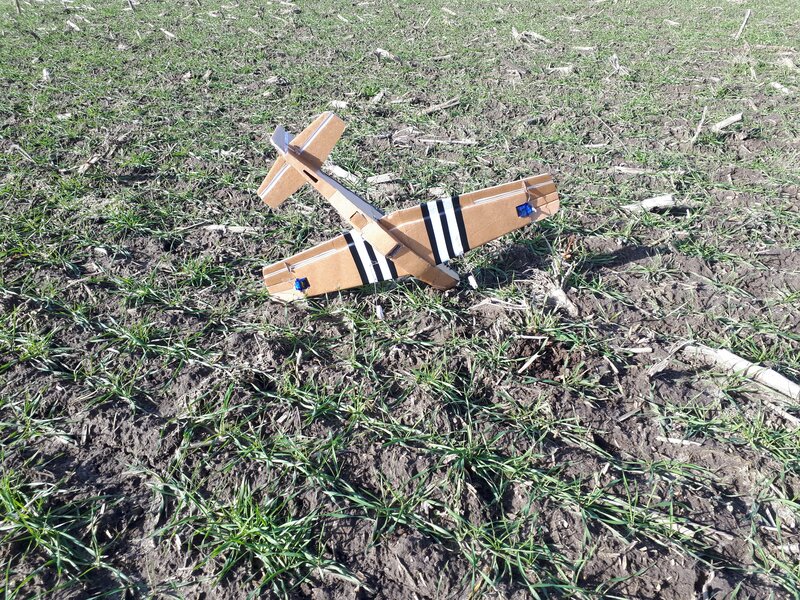 Not that in my first days of rc flying did my planes come back let alone in one piece. 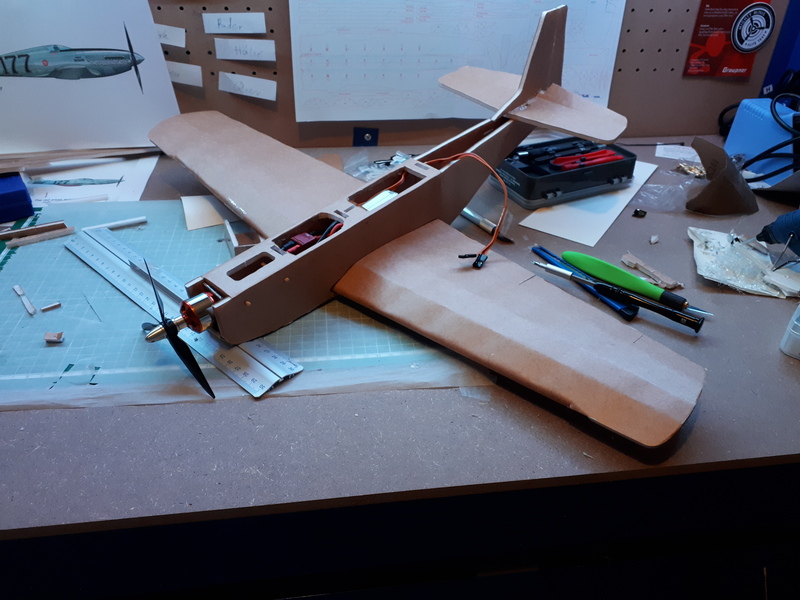 The very first rc plane I built was the Simple cub. I tried to do take offs and landings on hoops like bixler mentioned on the beginners series. And that didn’t work. So I tried hand launching the plane which wrecked it completely. That experience would have easily made me quit hadn’t I been one that does not accept failure. I then quickly became more active on the forum seeking advice from others and open this thread: Hobby Newbie Learning Diary; Family Included! (Tons of crash stories on the first few pages). I started learning to fly in baby steps learning why every crash took place and how to avoid it. Things as stupid as having the control surfaces reversed up to analyzing LOS (loss of signal). Don’t get me wrong I still crash and crash plenty, yes my crashes are less hard and break less stuff but that’s what practice does. What crashing and analyzing the reason for the crash does, you get better. Probably a ton of other examples I can find by sitting hours searching the phone photos. The thing to remember is that it’s only foam board and usually isn’t expensive nor takes months to repair or rebuild. What can get expensive is the electronics so learn how to take care of them properly and seek advice if you are not sure what you are doing. Last year I was watching someone fly a 60cc giant scale Edge. He was taking it easy, keeping it high, playing it safe. At the time I was wondering why he was being so careful. As he came in for a landing, a perception issue got the best of him, he came in short and into the crop. Ripping the gear off (the most common damage on giant scale 3d birds). The reaction was explosive. He swore, stomped, almost cried. I was taken back by the reaction. I made a comment about how this could be an excuse to get something new. He said in a very honest sad tone "I can not even afford to fix this one, let alone buy something new." I give this story to put it into perspective. 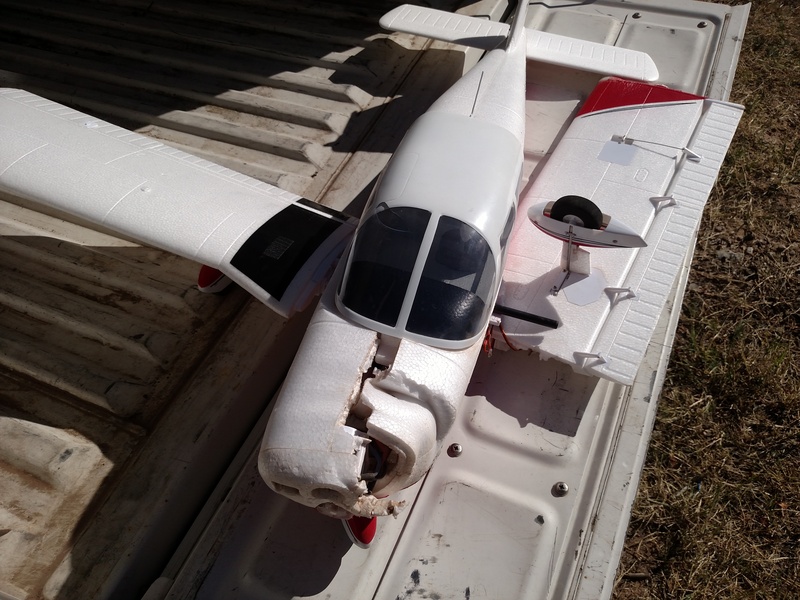 That was a $3500 plane, with a $900 airframe. 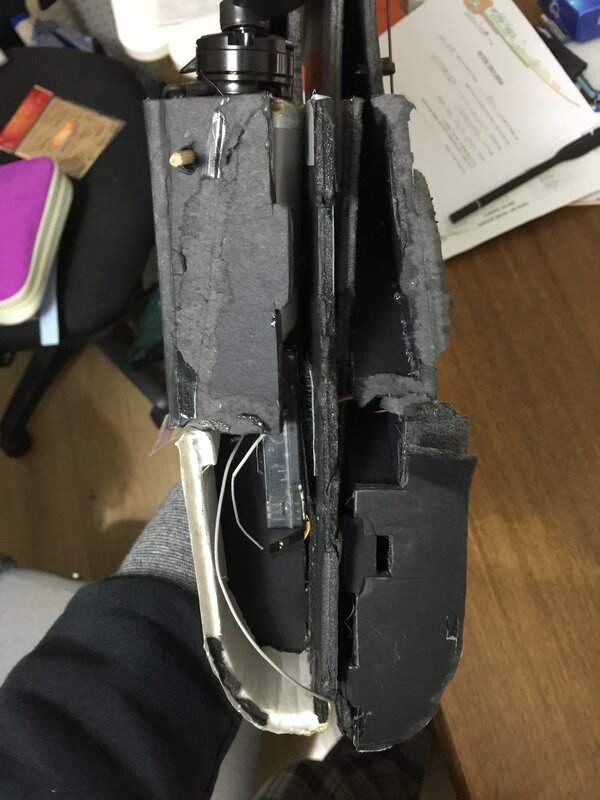 Cost to repair might have only been $150. He was flying something he could not afford to replace. On the flip side, I smashed my mig 3 into the ground and laughed. 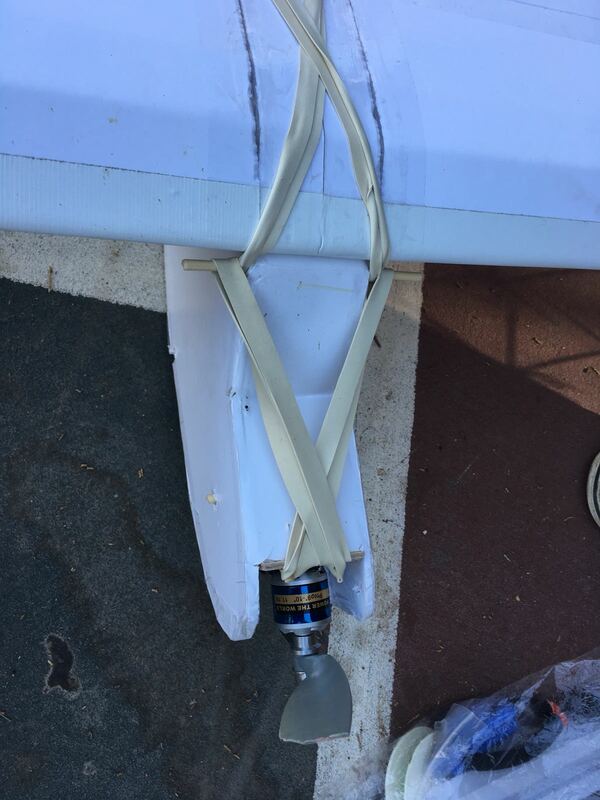 $100 plane with a $5 airframe, cost to repair was about $3. Crashing a FB airplane should never be sad. Just a learning experience, and maybe an excuse to build something new. I love FT designs. Not because they fly well, not because I like the planes in particular, but because there is no financial stress to flying them, no pressure, just all fun! 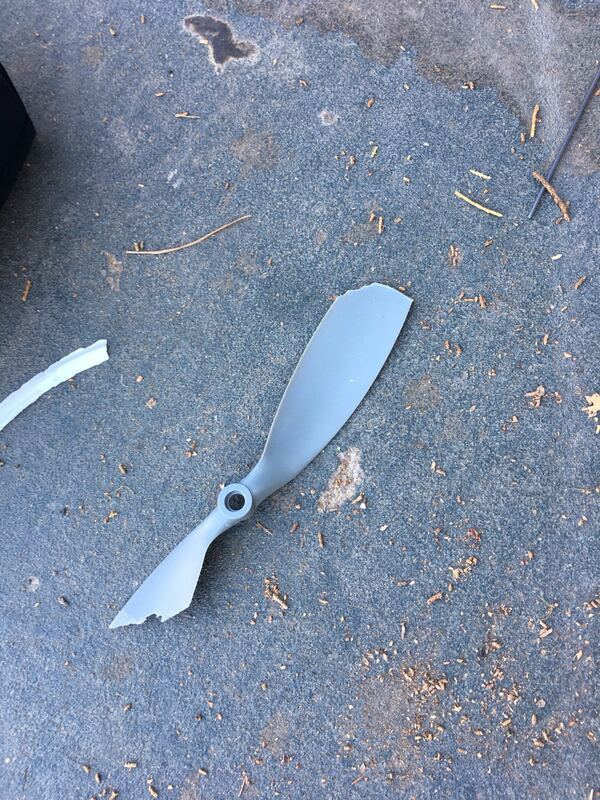 Side note: I also came in short when my muffler came off and I dead sticked my 60cc ARS-300 giant scale 3d plane. 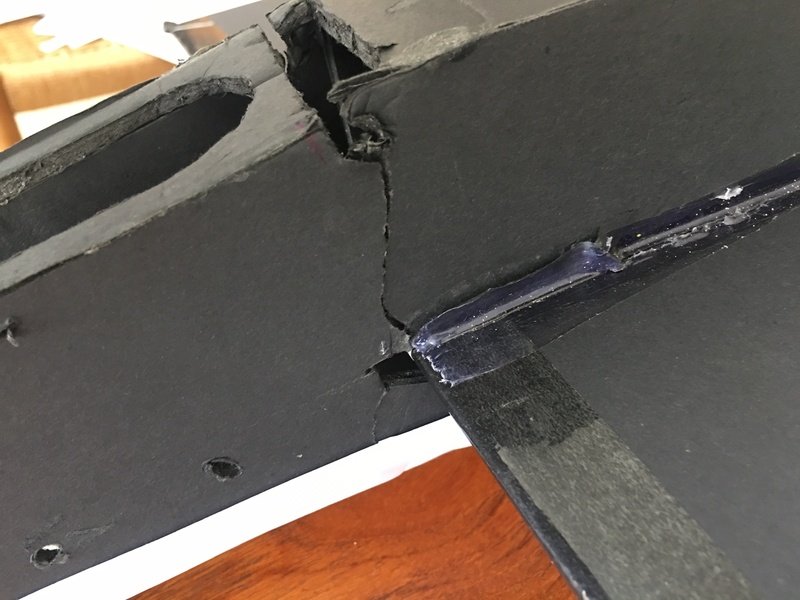 Gear ripped off, wheel pants went through the wings. I was so annoyed I put it on the top shelf in August and have not looked at it since. 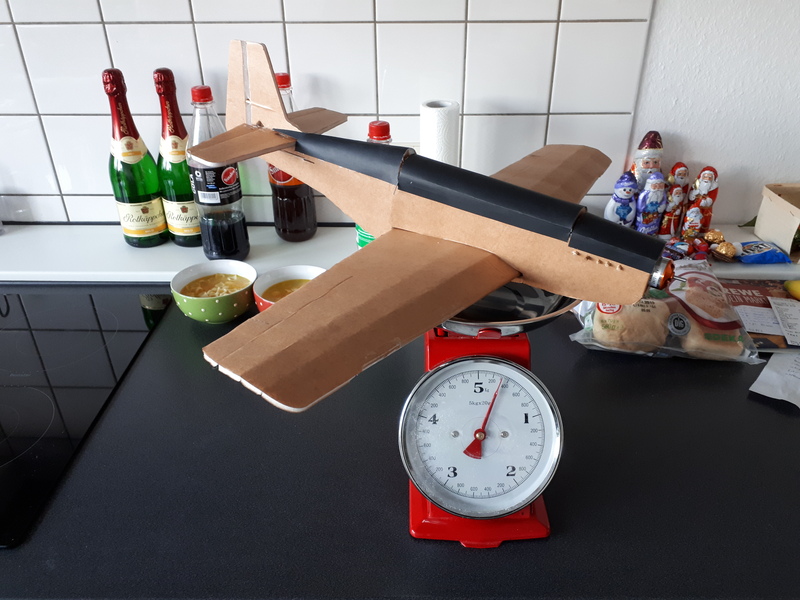 I built my first FT plane a week later. Have had epic fun ever since! 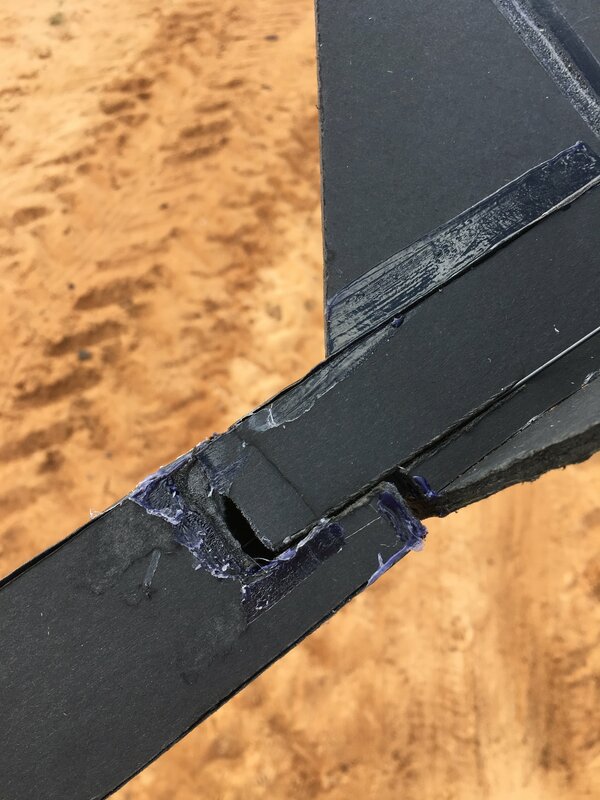 Tip the FT Edge Andre designed has a super strong airframe I haven’t broken mine too a point of no repair, and recently that has become my trainer plane. Lol I have a large hangar full of balsa planes, including a new giant scale Pitts model 12 on the build bench. I do not fly what I can not afford to replace. The other advantage to FT FB planes is by flying them I become more relatable to my flight students and others in my club. There is too much pressure to go big and expensive. Yes it is fun, and a good way to puff your chest and measure it, but I like being the guy who can go to a giant scale thing on Saturday, then show up at home field with an explorer on Sunday. I also plan on taking my seaduck to 3d events this year! Fly what makes you happy! Never fly more then you can afford! Then you will always be happy! The end of a good day today. 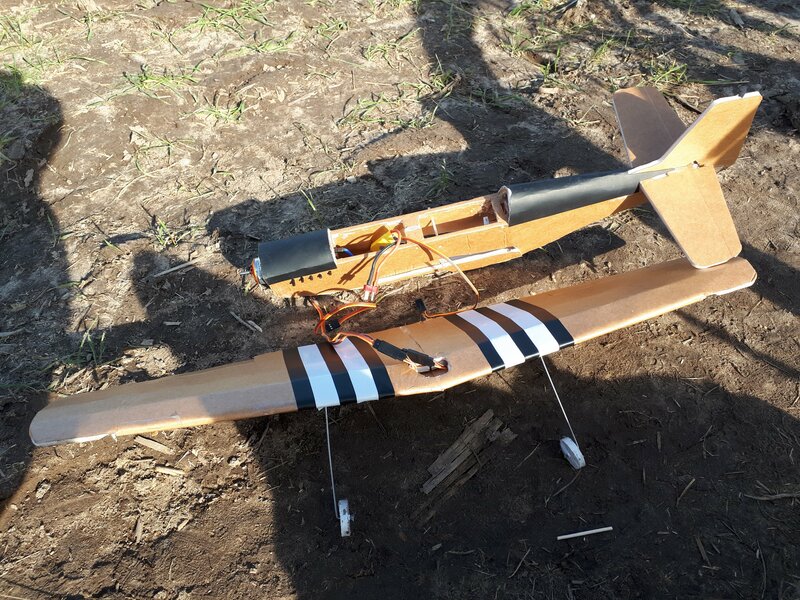 Destroyed 2 props, 2 power pods, 1 firewall, 1 nose and 1 battery. I agree with everything Headbang has said. I will also add that the “afford” part can apply to more than money. Time invested into making a master piece is gone forever even if the materials are free. I started my RC adventure with store bought kits. Not nearly as expensive as the kits Headbang is referring to, but $200+ airframes with >$50 repair costs every time you have a bad day. Money was not the biggest issue though. It was the fact that replacement parts are always out of stock. 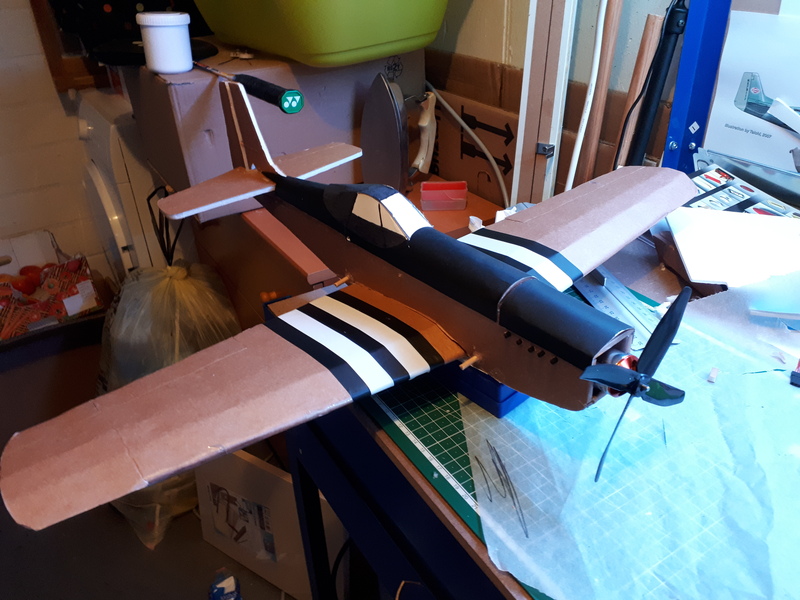 Once I found RCPowers, FliteTest and scratch building, I never bought another kit. I may have a little different perspective than most as I probably get more enjoyment out of designing and building than I do flying. Crashing for me usually means I just get to build a new aircraft which I enjoy. There are days however that I just want to fly. (usually with my hanger queens/store kits) When I crash those, it is a kick to the gut for sure. "...So I decided to over prop it. After a VERY sketchy hand launch, (>90* roll before I gained control), this thing was a rocket. It was on rails and it was so fast it was a blur! I was having the time of my life! Then I hear what sounded like a B17 @ low altitude on final just off to my right. "BBBBRRRRRRRRRRRRRRR!" Next thing I know, what I can only describe as a face hugger from the Aliens movie latches on to my face! Needless to say the Racer flying at a high rate of speed was no longer a concern and she rockets into the deck at +/-100mph. All that was left of that beautiful bird is that motor. 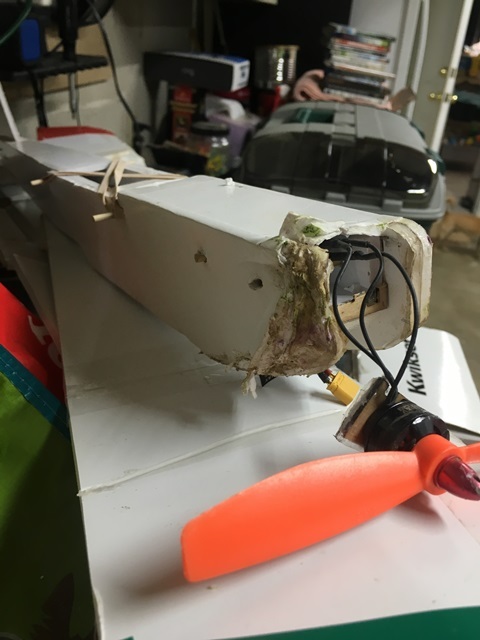 Somehow I managed to disintegrate an entire foamboard aircraft and bend the motor shaft into a pretzel, but the prop has not a scratch." Try it, It does help. I had my 60cc redwing extra 330sc. WE HATED THAT PLANE!!!! I was at an event and I pull up to do a pop top at half throttle. I had done it a million times before with the plane. 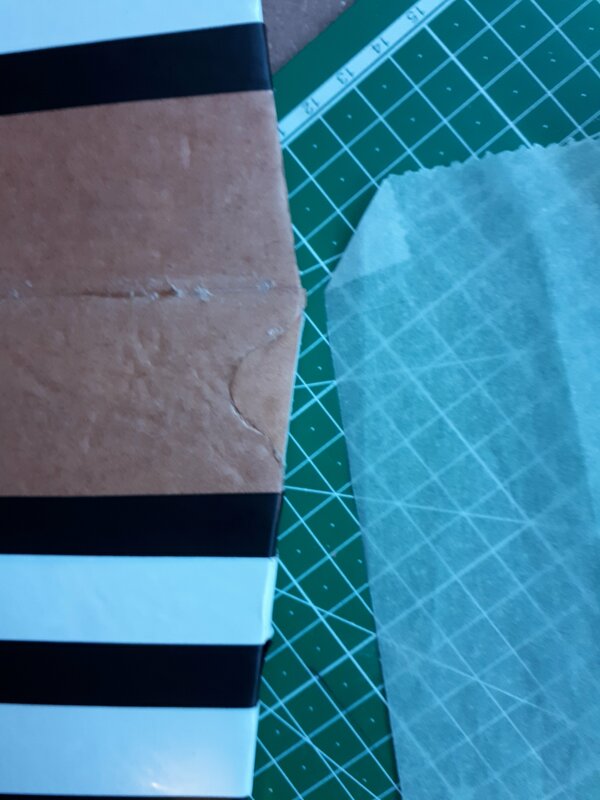 It lost the right wing and rolled onto the right side. I one winged it to where it was 300" from the end of the runway. I got it too slow and it turned and spun in. We went out there to find it and it didn't look that bad. We picked it up and realized it was a sack of balsa! We only had about 20 flights in on it. My eFlite Cherokee. It hit so hard, it snapped the motor shaft itself. I took off, thinking I had it in low rates, but actually had it at full rates. By the time I realized what I had done, I was in the panic-trying-to-recover mode, and mine didn't have the "SAFE" system (or whatever eFlite calls theirs) with the recovery switch. For a few seconds on the video, it looked like I was having a grand time with some aggressive aerobatics. Too bad none of it was intentional. I still need to get busy putting it back together, if I can. 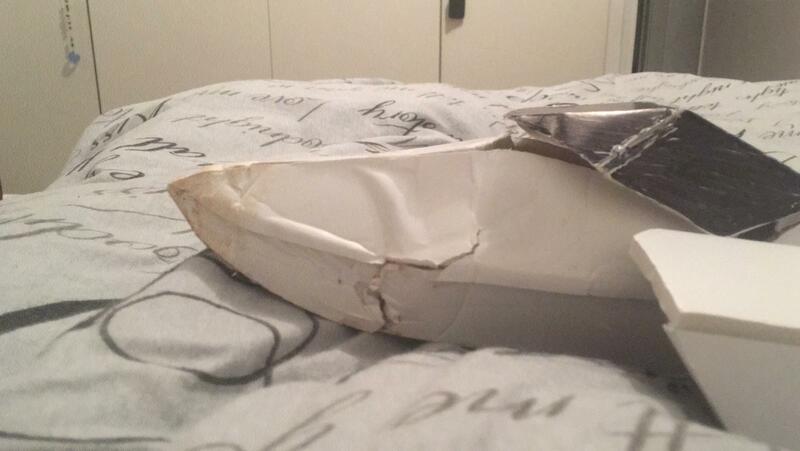 I think it’s repairable! Just a matter of time and will. Thought I’d share one from today just to show that I still do crash hard. Flying the TT today I broke the tail section to a point that the only thing holding it attached is the push rods and control horns . Pssst.. the edge 540 is not indestructable.. but boy is it tough. Looking at mine as we speak debating when I want to start rebuilding the nose.... ahhhgain. 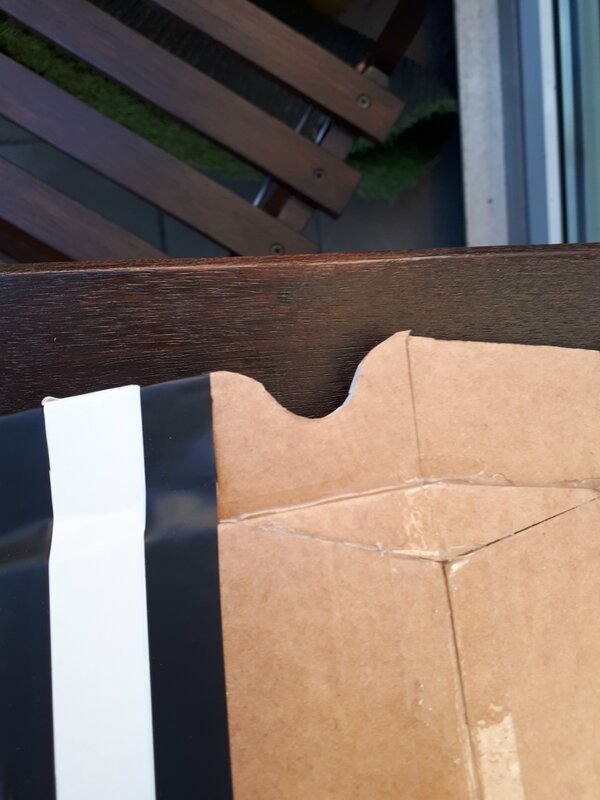 That’s the only thing that tends to break but if you wrap it with duck tape it gives it extra regidity. I have to remove it from the battery compartment before applying tape hehe.